Welcome, Stacy! Nice to have you here. Hi, Kayelle. It's nice to be here. Thanks so much for hosting me! What a fun short interview. I've read all of the Cathedral Lake Series (and most of Staci's other books) and have to say she knows how to keep a reader riveted to the page. 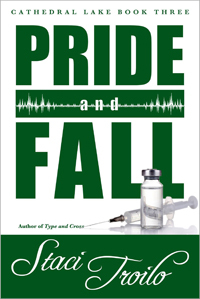 Pride and Fall is especially good, my favorite of the CL books. Wonderful to see Staci featured here on Romance Lives Forever. BTW, Staci, I have a hard time settling on genre too! Thank you for the kind words, Mae. That means a lot to me, especially coming from a talented author such as you. I agree, settling on one genre is hard. Isn't it nice that we don't have to? I'm excited to read Pride and Fall. This is such a great series! Staci is a really talented author, and like her, I can't stick with one genre! Fun interview, Staci! I love my sci-fi battles, fantasy realms, and horror worlds also. Thanks, Teri. Sounds like we have a lot in common! Kayelle, I had fun today. Thanks so much for having me here. I try, Kayelle. Don't know that I'm always successful, but I try! Staci, I loved the Cathedral Lake series and look forward to future stand-alone novels. Like you, I love suspense with a bit of romance weaved in. Congratulations Staci you are an amazing writer and Author, you inspire us to stick at our dreams too. Thank you. Thank you, Kath, for those kind words.